He wears a lab coat and black-rimmed glasses. He’s often wielding a syringe, filled with a glowing green liquid. And all he wants to do is stick that needle into dead things and bring them back to life. He’s Re-Animator‘s Herbert West, of course, and he’s a bonafide horror icon, like Freddy, Jason, Michael Myers and Leatherface before him. So why then has he never been immortalized as an action figure, like the majority of his fellow icons have been, several times over, throughout the years? It all began at the 2006 San Diego Comic Con, where SOTA Toys unveiled the fourth series in their popular Now Playing line. 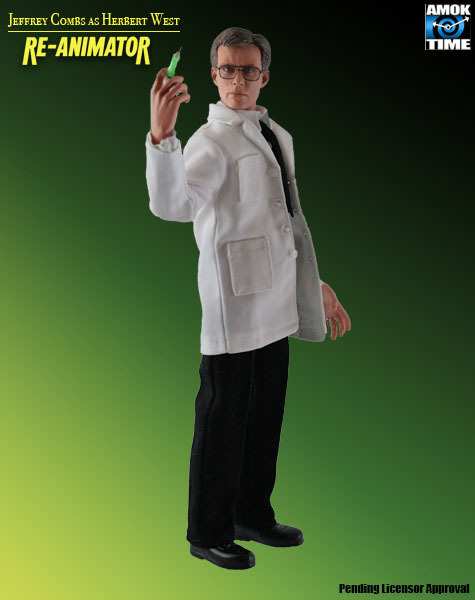 Previous series’ included the likes of a Killer Klown from Outer Space and one of the Nazi demons from American Werewolf in London, and Series 4 was to include the very first action figure of Dr. Herbert West himself. As you can see above, the figure was going to come complete with a syringe, Dr. Hill’s severed head and even the infamous undead black cat. Unfortunately, the Now Playing line was cancelled before Series 4 ever saw release, and West was one of the many figures that died along with it. SOTA Toys is still around to this day, though the Now Playing line has stayed in the proverbial coffin, and they currently have no plans of ever bringing it, or their Herbert West figure, back from the dead. Cut to three years later, in 2009. 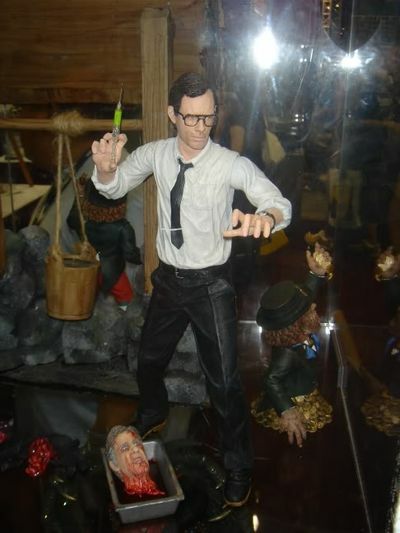 Executive Replicas unveiled images of this 12″ Herbert West doll, which was going to be sold exclusively by toy company Amok Time. With a head sculpt approved by Jeffrey Combs himself, the figure was set to include West’s trademark syringe and be limited to only 1,000 pieces, selling for $79.99 each. While the original 2009 release was soon pushed back to the following year, it wasn’t long before the doll was completely shelved, and the company cited a lack of fan interest in these prototype images as being the nail in the coffin of West’s second attempt to join the likes of Freddy and Jason on the toy shelves of horror fans like ourselves. They simply didn’t get enough pre-orders to warrant the production of the dolls. Oddly enough, Executive Replicas currently still has the figure listed as ‘Coming Soon’ on their website, advertised as being sold directly by them rather than Amok Time. I was able to get in touch with them over the phone earlier this week, however, and they told me that there are currently no plans whatsoever to put it up for grabs anytime soon. Could that change in the future? I guess only time will tell. 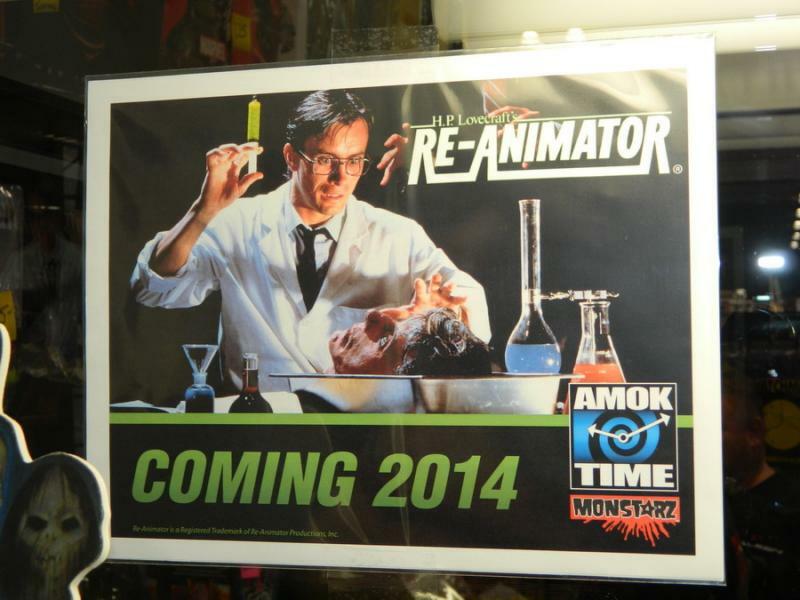 This past October, at the New York Comic Con, Amok Time made the exciting announcement that they had secured the rights to both Re-Animator and the sequel, Bride of Re-Animator, and would at long last be releasing the Herbert West action figure we’ve been waiting so many years for, as part of their Monstarz line. They promised that prototype images would hit the net around the time of this year’s Toy Fair, and with the start of Toy Fair 2014 just a few days away now, they have indeed made good on that promise. Yes. It’s actually happening. For real this time. Check out the just released prototype image of Amok Time’s Herbert West figure, which looks very similar to the one SOTA almost put out back in 2006, right down to Dr. Hill’s severed head being included as an accessory! Set for release this coming September, the figure will include interchangeable heads and hands, and pre-orders are set to begin on March 1st. Keep your eyes peeled on Amok Time’s website for further details. 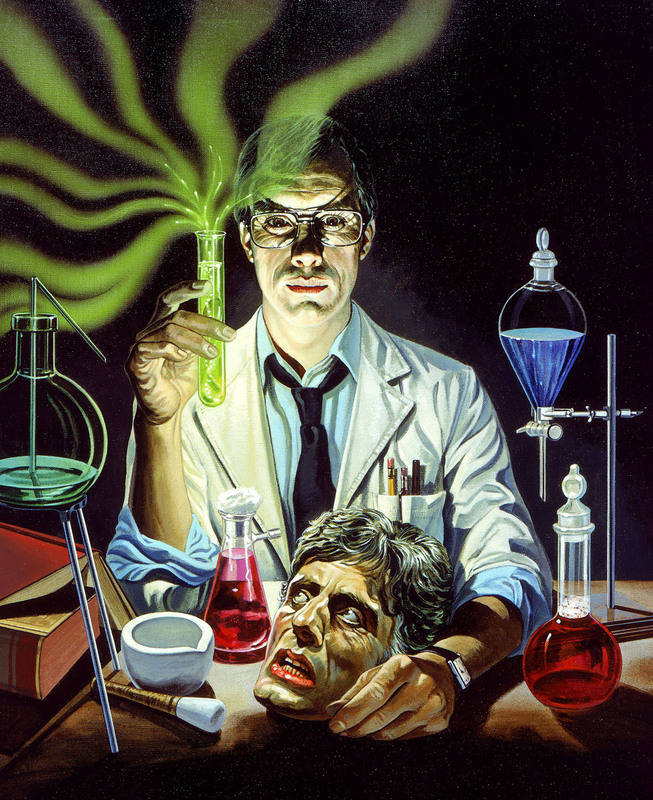 The company also teased future “Re-Animator goodies,” so stay tuned for more information about those as well. And there you have it. Eight years later, Herbert West finally re-animates our toy collections. Can I get a hallelujah? !